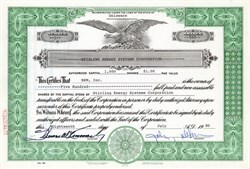 Beautiful RARE stock certificate #1 from Sterling Energy Systems Corporation issued in 1980. This historic document has an ornate border around it with a vignette of an eagle. This item is hand signed by the Company’s President, John Z. De Lorean and Secretary, Thomas W. Kimmerly and is over 37 years old. Thomas W. Kimmerly was also the Executive Vice president and Treasurer of the Parent Company, DeLorean Motor Corporation. The certificate was issued to BKM, Inc. Sterling Energy Systems Corporation was a company that was owned by De Lorean and was affiliated with De Lorean Motors. Possibly related to the Stirling Engine program.